The players in the chemical sector can meet very different packaging needs. From small businesses to large groups, CDA equips the chemical industry with the most suitable labelling machine, filling machine or complete line for each project. CDA, a French manufacturer of labelling machines, filling machines and integral designs, has developed a wide range of semi-automatic and automatic machines to meet the requirements of professionals specialized in chemistry. The production rates, filling / dosing techniques, capping techniques and many others are all elements that we can adjust to bring the best possible packaging to your products. Small and large players in the chemical industry market will find the right solution for their activity and its particularities hand in hand with CDA. To meet the specific needs of manufacturers of chemicals, detergents and solvents, we offer machines that can label, cap and fill containers with different shapes, caps, viscosities and materials. CDA offers a range of semi-automatic filling machines that allow small manufacturers to introduce automated filling of their products and thus increase productivity. Our semi-automatic filling machines benefit from maximum precision thanks to the best counting systems. Detergent, solvent, insecticide… our filling machines are equipped with different pump system depending on the viscosity of your products. A CDA automatic filler will allow you to increase your production rates and benefit from maximum filling accuracy. No matter what liquids and formats you need to fill, CDA has a solution for you. The monoblocks developed by CDA enable you to fill, cap and label your chemical products in a single machine. Do you need an additional solution for the automatic feeding of your cans on our labellers? A marking option to enter legal information? We have the products you need. Independent screwing machine manufactured by CDA. This automatic screwing machine can be used on most caps. The chemical industry is a sector that has been part of a positive dynamic for several years now, continuing to cover a wider range of products and activities (bio-chemistry, fine chemistry, mineral chemistry, etc.). Nevertheless, competition is important in this industry, which is constantly renewing itself, pushing companies in the sector to seek ever greater productivity. Packaging needs in the chemical industry are therefore varied and specific, particularly because of the specificities of each company’s activity and production. Thus, the format and materials of the containers, the desired speed, precision and filling technique become decisive factors in the choice of a filling and/or labelling machine. Well aware of these challenges, CDA has been able to adapt its entire range of labellers and fillers to the chemical sector. 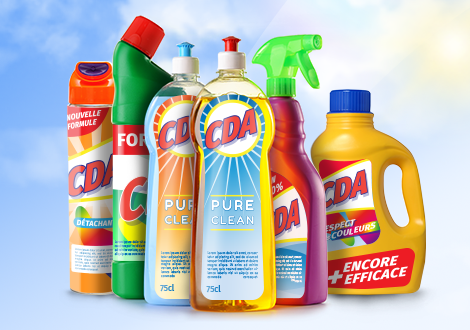 The CDA machines are indeed equipped to meet the specific constraints of the sector: regulated labelling, instructions label, multiple labels and container formats, presence of spray caps… we adapt the labellers and fillers to the specificities of the products to be packaged. CDA has developed a wide range of semi-automatic filling and labelling machines that perfectly meet the very specific needs of very small businesses that often have limited space and whose production can be optimized. These machines have several advantages: compact, precise and easy to use are among the features that our customers have come to appreciate. SMEs will be able to acquire an automatic filling or labelling machine with higher speeds and applications than semi-automatic models. An automatic labeller or CDA automatic filler can be integrated into existing packaging lines. The scalability of our packing solutions is an undeniable asset for a company that is developing its business. For large chemical companies, we offer integral designs (filling/dosing, screw-capping, and labelling on the same machine) or complete packaging lines made to measure by our design office to perfectly adapt to your activity.